Enticing, a bar situated in front to the left of the entrance is forgone for a decorously set, pristine-white-linen covered table. If there is only one point to bring me back to this restaurant it is the service. Saying the staff is well trained is like pointing out that water is wet. 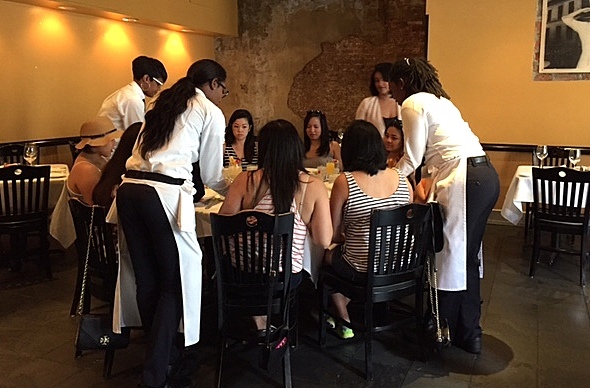 Without fawning over customers, impeccable service is clearly fundamental here. 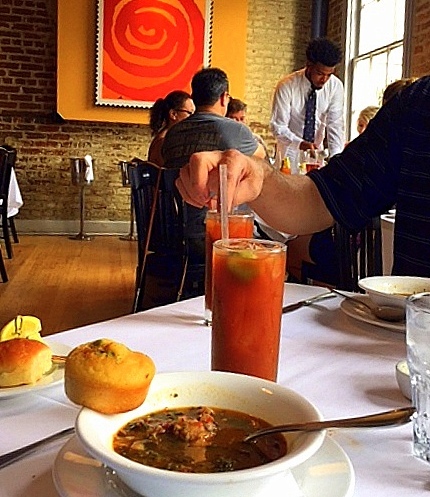 NOLA SIGNATURE BLOODY MARY, made with bell pepper infused vodka and crowned with spicy green beans is fairly tame but wields enough tongue and lip zapping heat to leave a happy buzz. Soup, willingly offered to split between two bowls was absolutely divine. Collard greens and ham hock bits floating in a pot liquor broth is meaty, full flavored nourishment. Plenty of heat and the underlying slap of vinegar turns this brew to perfection by crumbling into the mix a jalapeño corn muffin. We want more of this. 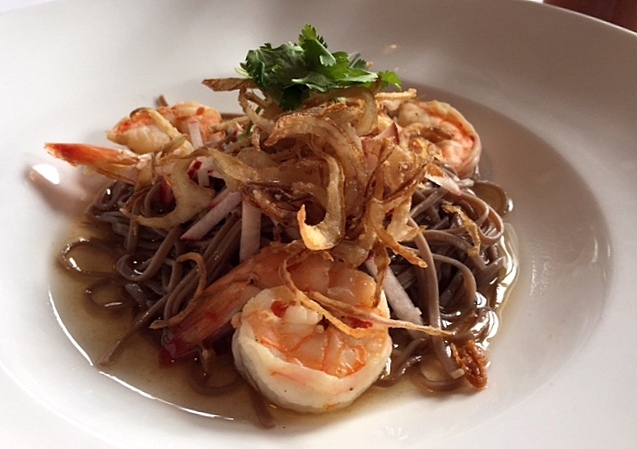 Soba noodles in lightly nuanced citrus broth with poached shrimp, frizzled onions and slivers of fresh crisp radish is a nice option and change from some of the heavier creole dishes. This one though needed a spark of something more. In discussion with our server, we both agree that a little ginger and maybe soy sauce might perk up the pretty dish. 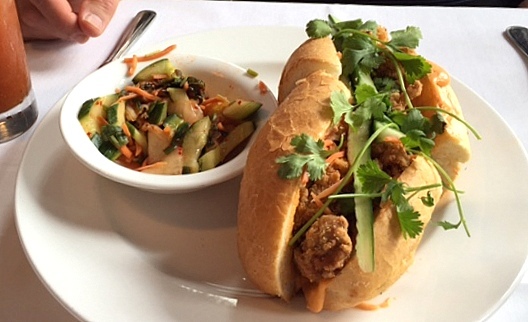 A fried oyster báhn mì, spicy on it’s own is an interesting twist on a local favorite, the po boy sandwich. Bread, the vehicle that makes a hero spectacular is perfection here. Upping the sweat inducing value is a nasal penetrating peppery cucumber kimchi salad. Chef Brian Mottola’s recipes put an interesting and fun spin on the menu, but Lagasse’s legacy of impeccable service and cultural history is evident throughout. The restaurant is a modern eatery in a city full of long-established benchmarks. The contradictions do not go unnoticed. All of the orders arrive at the table at the same time. 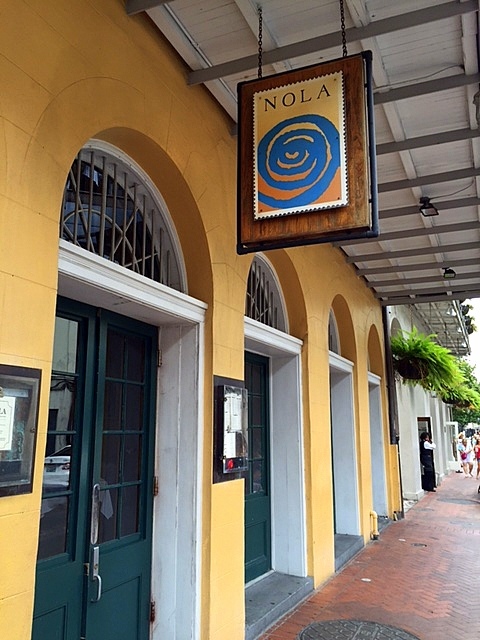 While many tourists are here to fill a hedonistic need, some are appreciating a distinguished culinary revolution with new, inventive and scintillating twists. 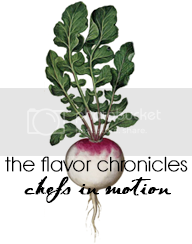 A focal point destination for everything that is right in the world of food — but of course taste and flavor is always subjective. 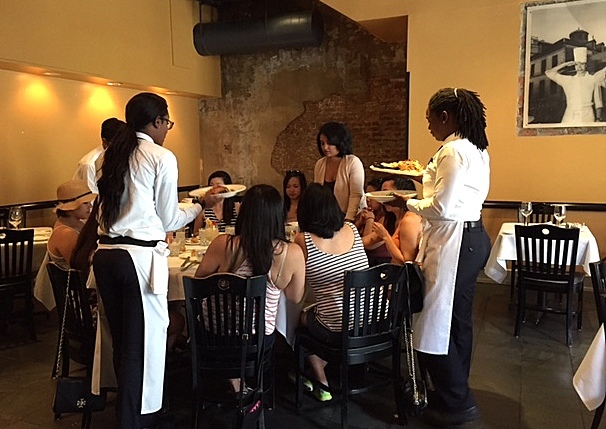 Lunch is served and no one is left without — impeccable service.